Drape Me Gold is a Mumbai based online boutique founded by Meghna Pandey. They specialise in handcrafted, customisable clothes for women and kids. The idea was to create a brand that offered customised clothing without hurting your pockets too much. We got an opportunity to talk with Meghna, the founders of Drape Me Gold and see what she has to say. I am sure her interview with us will inspire you. 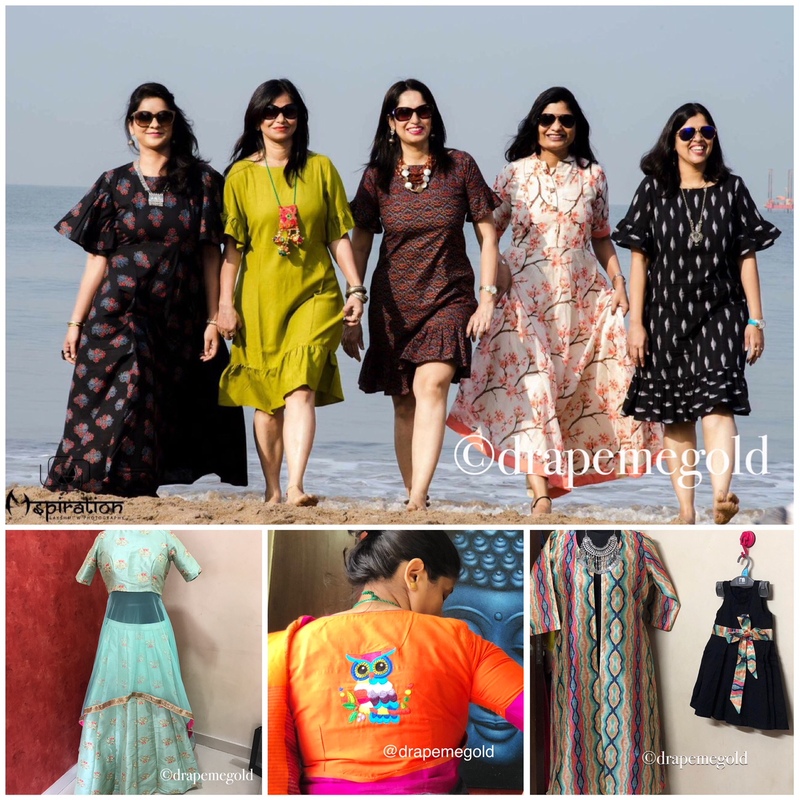 Drape Me Gold – western dresses with an Indian twist, is an online boutique store based out of Mumbai offering handcrafted, customisable clothes for women and kids using fabrics indigenous to India. We love working with handlooms with ajrakhs and Ikat being our favourite fabrics. Started in 2016 by Meghna Pandey, a post graduate from SPJIMR in entrepreneurship. After completing her education, she worked with Marico – Kaya skin care brand for about 6 years, working in various roles in training, operations and the IT department. When motherhood came calling she decided to quit to raise her family but the itch to start something of her own was already in her mind. As someone who was fond of comfortable yet stylish clothes she felt there was a huge gap between what was being offered by the brands in the malls and the designer clothes whose price points were not appealing to a wide audience. The idea was to create a brand that offered customised clothing without hurting your pockets too much. we are based in Mumbai but being an online entity, we started selling via Facebook only and then went on to include Instagram too before the website was recently launched. Though the competition in the clothing industry is high, what sets us apart is the choice to the end user to customise the dress / blouse. Our USP is that one can customise the clothes as per their choice making each creation unique and as per ones own style and preference. We are known for our perfect fitted quirky blouses and comfortable indowesterns. I think being a mompreneur is one of the most difficult jobs but there is so much inspiration that one derives from others success stories. The most important part of maintaining work life balance for me has been to allot fixed timing for work and trying to completely switch off when giving your family time. No, this is a self funded startup. I think the biggest misconception people have about successful people is that they think its mostly luck. Few people see the tears, handwork and pain that goes behind making something successful. Also no one knows about the mistakes and failures that are just ours to learn from. The growth potential of our company and the thrill of making new designs, seeing happy faces is what makes us excited and keeps us going. My typical day is switching roles between a homemaker, mother and entrepreneur. Day starts with getting the child ready for school, breakfast for the family. Once the house is empty and chores for the day over is when the transition to the entrepreneur starts. The day ahead is then divided into going to the workshop, purchases, client follow-ups and sales. Once the family is back home, the home maker returns too. We initially started with just designer saris and a single Karigar. Slowly through trial and error and market analysis we scaled up our product range to include saree blouses, Indo westerns, mom n me dresses, kids wear and trousseau collection and a team of 5. Going forward we plan to expand to include various designers to our fold to give the customer a complete shopping experience.